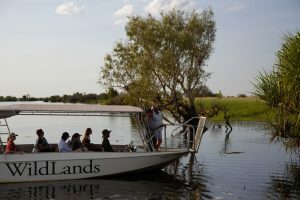 Experience the beauty of the majestic Mary River wetland system on one of our guided airboat tours or river cruises at Corroboree Billabong, Northern Territory. Corroboree Billabong, just 90 minutes from Darwin along the Arnhem Highway, is a part of the Mary River which is one of eight rivers in the Top End with large floodplains in their catchments. These floodplains are an important breeding and feeding ground for water, shore and sea birds as well as providing a habitat for large numbers of freshwater and saltwater crocodiles. 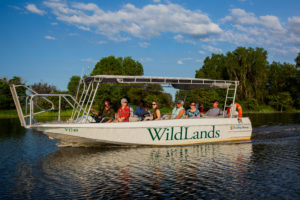 Wildlands Wetlands Safari Cruises offers ideal ways to view the flora and fauna of this amazing ecosystem in total comfort. 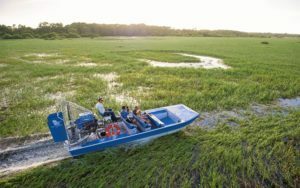 You can glide across the wetlands on a guided airboat tour or take a guided cruise through the waterways on custom-built boats that are made to navigate Corroboree Billabong. We offer a variety of different tours and times to suit everyone and our guides are very knowledgeable about the surrounding area. This is a part of the Northern Territory that you don’t want to miss! The intimacy of experience was everything. The guides were both excellent giving great brief but in depth explanations of the billabongs habitat. Being able to stop in the middle of a lily forest was unique. I don't think you could get any closer without getting eaten. I didn't know what to expect when we booked this tour. I thought it might be a pleasant enough experience with a competent guide. It exceeded my expectations and turned out to be the highlight of my visit to Darwin! We did the combo tour, starting with the air boat and followed by the cruise. Both were brilliant. The air boat with Chase was magnificent. I had never been in such beautiful and interesting surrounds. We saw crocs, birds, lilies and stunning landscapes. The cruise with Connie was leisurely and filled with more flora and fauna including more up close and personal encounters with crocs. What warmed my heart was was the passion Connie and Chase exhibited for their environment.They were knowledgeable, respectful and joyous and you could sense that this was an adventure for them as well. I could not have been more happy with our decision to do this activity. I highly recommend it.